Where did we get “buster” as in “Look here, buster”? 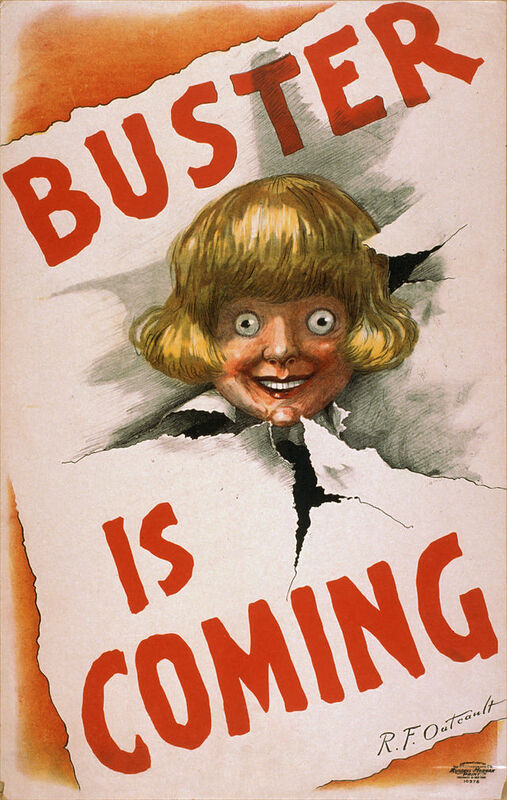 Americans, at least, have for some time used buster in speech or dialogue as a generic form of address. It has a range of tonalities, from light to affectionate to grimly confrontational. Listen, buster, you can't beat me no matter how hard you try! All right, buster, this time you're going down for the count. As a generic or playful address to a male, from 1948, American English. 1948 A. Seager Inheritance 174 ― ‘Hi-ya, buster. What’s new?’ he heard a woman’s coarse voice say. 1962 A. Shepard in Into Orbit 101 ― ‘OK, Buster,’ I said to myself, ‘you volunteered for this thing.’ 1965 P. Arrowsmith Jericho xix. 199 ― If you go on accusing me of attacking you lot, buster, you’ll have the police to answer to. Yet it's used as a name much earlier (Buster Keaton, Buster Brown, etc. ), and as the title of comic strips and even a play (see below). It's hard to imagine that the two uses are unrelated. Buster. 'A name for anybody whose real name may or may not be known to the speaker. Usually but not necessarily pejorative. "Now listen here, Buster, this means trouble!"' (Leechman): Canadian: adopted, ca. 1920, ex U.S. It's not clear to me how it got its present meaning from burster or buster (meaning "a gay, roistering blade"), and it certainly doesn't seem likely that it arrived from the meaning of a breaker of horses. So I'm wondering. Did this just spring into the language fully formed, like Athena from the head of Zeus? Or is there a more mundane, less divine explanation? b. A form of address to (or occas. a term for) a person, esp. a man, variously expressing affection, familiarity, disrespect, or hostility. Formerly freq. in old buster. 1838 New Yorker 24 Mar. 4/1 That's generous, old buster. A person who or thing which is impressive or remarkable, esp. in being more than typically large, loud, etc. So perhaps a big, loud person causes things to bust open, or causes a loud noise to bust out from themselves. Hence, buster. Not the answer you're looking for? Browse other questions tagged etymology slang north-american-english idiom-meaning vocatives or ask your own question. Is addressing a guy as “guy” rude? Where did “I'm Jonesing” get its meaning from? Where did the phrase, “You did a bean,” come from? Where did we get the “fours” in “on all fours”? Where does “get-go” come from? Where did the Greeks get their word “bio” from?